Known as canyoning in the UK, canyoneering in the US, in Spain as barranquismo and in Welsh as "cerdded ceunant".......in case you've ever wondered. Barranquismo is quickly gaining popularity in Spain. The simple definition of the sport, is a technical descent of a gorge, which usually involves coming down a river. 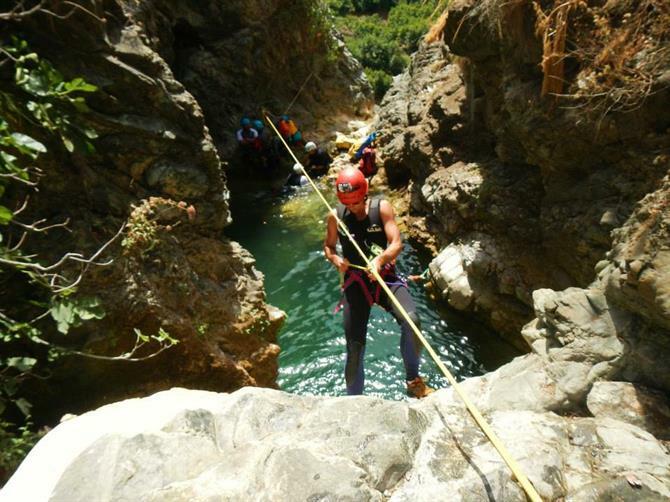 A typical Barranco involves abseiling, some ropework, climbing, jumping and swimming. It is easy to understand its appeal. First and foremost, canyoning is a lot of fun. It's a great way to get out into nature and see new areas that are not accessible by foot. It's a particularly appealing pastime in Andalucia and especially during the summer months, when any relief from the searing heat is welcome. Andalucia is a canyoneer’s paradise. With its numerous high mountain rivers and streams; unexplored territory with exceptionally clean, crystal clear waters. The scene and environment is almost fairytale-like. Most of the barrancos in Andalucia are also fairly accessible, making a big difference when carrying equipment in 30+C degree heat. The more mountainous provinces of Malaga and Granada offer the best canyoning. Jaen has some good routes but many of them are officially ‘closed’. For those that are open, you will also need permission from the local department of environment (medio ambiente) beforehand. In Cadiz, the Garganta Verde, near the village of Zahara de la Sierra is the spot to practice barranquismo. The area is carefully protected and permissions also need to be applied for well in advance. But it’s a highly recommended route. As with any sport and particularly one that is practised in the mountains, canyoning can be dangerous. You need to bring the correct equipment and know how to use it. The gear list would include: climbing hardware, ropes, helmets, wetsuits, and occasionally specially designed shoes, packs and rope bags. Once you have started a descent, the remoteness and inaccessibility of many canyons make any rescue complicated and time consuming. You also need take into account that mobile phone coverage is normally non-existent. The biggest danger, however, is the water. Flash floods are very dangerous. A canyon can ‘flash’ in seconds and be caused by rainfall many kilometres away. A dry canyon can quickly become a violent torrent due to a severe thunderstorm in the vicinity. Always check the weather forecast beforehand and take particular care in the spring and winter months. There are plenty of professional companies offering to take you, we advise that you take a guided route with a company, rather than try it on your own. The tiny village of Jorox in the heart of the Sierra de las Nieves natural park is home to a great river for canyoning. The route itself is very short (about two hours) and provides a great introduction to canyoning in Andalucia. The river offers three or four abseiling points (including one of 26m), a couple of short jumps and passes through some areas of beautiful lush vegetation. It’s a very pleasant route. You need two ropes of at least 30m and wetsuits (the water is cold even during the summer months). When finished, you can walk back up to the village (no need to bring two cars - it takes about 30 minutes to walk back). Be sure to stop for lunch in the Bar de Antonio. All the food is home cooked and very reasonably priced. Antonio serves up whatever he has freshly cooked and will often insist you help yourself to drinks and desserts from the restaurant’s selection. A real character indeed.